A story of reconnection, lost love, and the power of faith, Heart Land follows a struggling fashion designer back to her small Iowa hometown as she tries to follow her dreams of success and finding true love. Grace Klaren has finally made her dream of living in the Big Apple and working in the fashion industry a reality. But when she’s unexpectedly fired and can’t afford the next month’s rent, Grace does something she never thought she’d do: she moves back home. Back in Silver Creek, Iowa, Grace is determined to hate it. She rails against the quiet of her small town, where everything closes early, where there’s no nightlife, where everyone knows each other. She’s saving her pennies and plotting her return to New York when she almost runs over a man who’s not paying attention at a crosswalk. It turns out to be Tucker, her high school sweetheart whose heart she broke when she left ten years ago. They reconnect, and Grace remembers why she fell for him in the first place. And her career begins to turn around when she finds a gorgeous but tattered vintage dress at a flea market. She buys it, rips it apart seam by seam, and re-creates it with new fabric, updating the look with some of her own design ideas. She snaps a picture and lists the dress online, and within a day, it sells for nearly $200. Suddenly, Grace has her ticket out of here. But Grace can’t fight her growing feelings for Tucker. Sometimes when they’re together, Tucker paints a picture of what their future could be like, and it feels so real. And when she finally gains the funding to move her new business back to New York, Grace must decide where home really is—will she chase her long-held New York dream, or find a new dream here in the heartland? 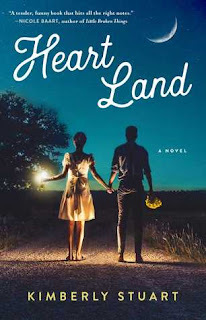 Heart Land was a sweet and romantic story about second chances in life and in love. I was pleasantly surprised at how much I connected with the main character and I quickly came to love her personality as well as her grandmother's. The characters were well developed and the story was entertaining and full of romance. I was drawn in instantly and loved the pacing of the novel as well. Heart Land was a really cute and fun read. It kept me guessing and was full of emotional roller coasters. The characters from Iowa were by far my favorite portion of the novel because I just loved the camaraderie and joy that they brought to the story. I would highly recommend this to readers who enjoy contemporary reads. Thank you to NetGalley and Atria for sending this novel in exchange for and honest review.